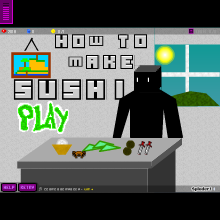 This game is a legit tutorial on how to make california rolls. Some quick things to add if you actually try making sushi off of this game. Put the rice in a pot with water about 1/5 higher than the rice. Turn the flame on high and wait for it to boil. When it boils, turn the flame to low and put a lid on and wait for 6 minutes. Let it cool and season it with rice vinegar, sugar and salt. Lay the rice out on a sheet of nori and add the stuffing. Roll it and cut it into eighths. Look up exact details before trying this! Thanks for playing!